This year we decided to try winter camping with our new trailer. There are a handful of campgrounds open in the provincial and national parks but we’ve pretty much stuck to Banff Tunnel Mountain campground since it’s right in town so there’s restaurants and attractions. So far we have lucked out, choosing reasonably warm weekends, which has allowed us to get out during the day and enjoy the town. And we are really enjoying it! Here’s what I’ve discovered: I love being out in the Rocky Mountains and Banff National Park in the summer – the camping, the hiking, the amazingly blue-green lakes, the long days of clear sunny skies, the crisp nights by the campfire, I could go on for pages… But I love the town itself in the winter! Strolling along Banff Avenue through a flurry of soft snowflakes, with a warm cup of tea or hot chocolate, is much more chill (‘scuse the pun) than attacking the pavement amid the flurry of tourists and buses that fill the main street in the summer. And the smaller crowds make it easier to get in to your favourite restaurant or bar. The deep snowbanks mean donning your snow boots but, along with the frosted evergreens and glistening icicles, they give the town a romantic story-book quality and provide a great base for winter sports. And there’s nothing like sitting in the Banff Hot Springs with steam crystallizing on your eyelashes. Something else I’m discovering is that the frosty climate doesn’t require hunkering down inside just because you’re not hitting the slopes (though the fireplace does beckon…) The area is an endless winter playground full of outdoor activities for those who dare brave the sub-zero temperatures and vertical topography. Many of you may have experienced the thrill of skiing mountain runs and late-night pond skating, but here’s some lesser-known activities accessible during the winter season. 1. CAVING The immense size of the Rocky Mountains has often left onlookers with a numbing sensation. These natural wonders have interiors that will deliver an equally astonishing awe. Rat’s Nest Cave, located just outside of Canmore, is the best place to take a trip outside of the elements. Accessible year-round, as the cave’s temperature does not vary, a maze of naturally sculptured chambers provides visitors with a unique way to discover what lies beneath the millions of tonnes of stone shooting sky-high. Book and join a tour with a knowledgeable guide (try Canmore Cave Tours) or examine the leftover fossils and discover twisting passages with your own adventurous spirit. Clothes that you’re willing to get dirty and headlamps are musts- unless you want to be left behind. Adventure tip! Braving the tight squeeze of the Laundry Chute (area deep within the cave) leads you towards long narrow passages and an area called the Grand Staircase. Pools of crystal clear water welcome those that have made the journey deep into the caves. 2. SNOW TUBING For those looking for a thrill down the hill without strapping on the ski boots, snow tubing is a fantastic alternative. On the slopes of Mount Norquay (Banff’s closest ski hill) several man-made trenches have been dug out to provide individual tubers with an exhilarating experience. The magic carpet makes going up and down the hillside carefree, and evening hours (Friday/Saturday) allow for a unique evening outing. Adventure tip! If you’re with a group, ask to go down attached. Don’t forget to get a ‘spinning send off’ from the folks operating the runs! 3. HIKING Grab your extra thick wool socks and $600 North Face coat; it’s time to talk winter hiking. Stunning views await if you are willing to take the added risk and difficulty of trekking through snowy forest paths and scrambling on icy slopes. The end result is a rewarding experience greater than that of your usual summer trek. For a moderate to difficult hike: try Ha Ling Peak, Canmore, or Sulphur Mountain (each 3-4 hrs roundtrip). We prefer these trails as a viable option to some of Banff’s longer full day trips (like Rundle or Cascade), due to the limited day light that quickly disappears over the valley come late afternoon (and due to the option to ride the Sulphur Mountain gondola back down at no charge). The additional risks of hiking this time of year shouldn’t deter those eager to do so. Be sure to check-in and -out with the Park Warden’s office in Banff before attempting any advanced trail hiking, especially in the winter. 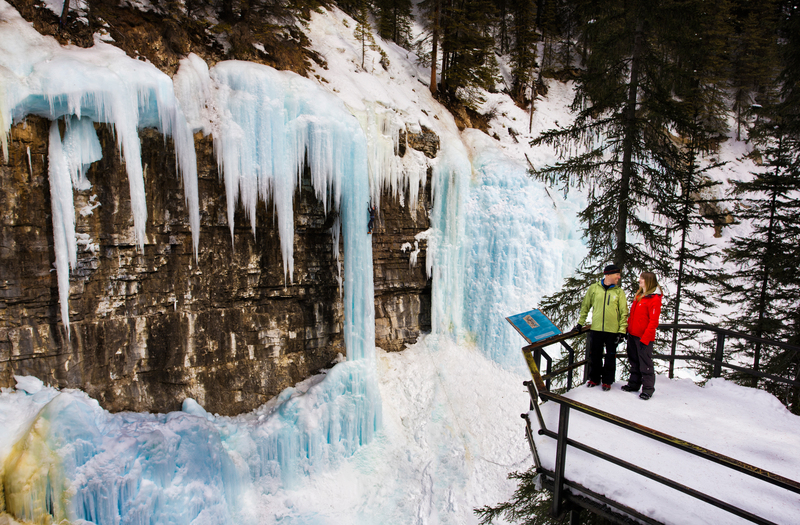 If you’re looking for an easy and handheld stroll, look no further than Johnston Canyon (one of favourite places in the park – any time of year!) The glacier water freezes over elevated edges presenting onlookers a chance to see Mother Nature’s power at a standstill. Very popular (and for good reason), there are no restrictions or limits as your Great Aunt Josephine could do this, even with her bad hip. Grotto Canyon (near Canmore) also offers a great beginner winter-trek as the slow stream of water freezers over making for a slippery walk inside the mountain’s narrow path. Plan for about 2 hours and keep your eyes peeled for the red ochre aboriginal artwork on the canyon walls as you pass through the narrowest part of the gorge. Adventure Tip! 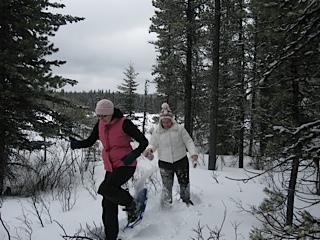 Winter hiking can be dangerous when dealing with Alberta’s unpredictable weather. Dress for the worst, hope for the best! 4. DOG SLEDDING Pioneers on this immense landscape had limited options of transportation in the past, and their initial practice of dog sledding is still alive today with the added comforts provided by several tour companies. There’s nothing more authentic than the feeling of being pulled across the winding forest trails as the sounds of howling husky’s echo throughout the valley. Tours mainly consist of a 2-hour journey through the forested campsite alongside Spray Lake, or over top of it (taking you into Kananaskis Country). Various options offer everything from heli & sledding tour combos to overnight camping, for the truly devoted…the dogs aren’t gonna pull my trailer! The majestic look and appeal of the dogs who make this experience possible is worth every penny, never mind the ride. Short on time and/or cash? An alternative can be found at Yamnuska Wolfdog Sanctuary. Get off the usual route between Calgary and the mountains (Highway 1) and head towards Cochrane on Bow Valley Trail (Highway 1A). This is also a nice alternative to the scenery on main highway. Stop at the sanctuary on your way to or from Banff to witness and interact with these hybrid gentle giants. The only problem is trying to leave without adopting one… or two. Adventure Tip! Go for morning/early afternoon tour when the dogs are fresh and energized. 5. SNOWSHOEING As Canadian as maple syrup, snowshoeing is by far one of the most underrated activities conveniently available to all that visit a National Park. Modest skill and effort make for a fun-filled day, especially if you pack some Fireball Whiskey or Hot Chocolate and Bailey’s for whichever route you take! One area that should not be missed is Marble Canyon. Make the ½ hour drive into the British Columbia side of the Rockies on Highway 93 – it’s worth the gas money. Rich in diversity, Kootenay National Park (est. 1920) is located in the south-western side of the Rocky Mountains. Marble Canyon offers an easy, yet breathtaking wander over the deep-cut canyon below. If this is too touristy, feel free to make your own path and explore the surrounding area. This can be done all over Kananaskis Country, where the trails are flatter and less crowded. Adventure Tip! Snowshoes can be rented at several equipment shops and even at both Fairmont properties (Banff Springs and Chateau Lake Louise) or in Calgary before you head out. 6. THE BANFF CENTRE The mantra ‘inspiring creativity’ correlates seamlessly with The Banff Centre. Supported by a network of national and international art programming commissions, the centre has become a true hub for those in the arts community. Regardless of your interests, events held weekly provide a wide-range of entertainment for all, with several major contributors. Winter is not nearly as jam-packed with performances compared to the summer frenzy, and it’s a welcomed change and good excuse to stay-indoors on a chilly January night. Culture Tip! Don’t miss Mountain Film Wednesdays- free screenings of snow-sport films from the past Banff Mountain Film and Book Festivals (another reason to visit Banff in the winter). 7. FESTIVALS & CELEBRATIONS Between the towns of Banff and Canmore, and the Village of Lake Louise, there seems to be something happening every weekend. In fact, as we speaker Snow Days is on. It’s annual but in 2015 it started January 8th and ends February 10th. What’s SnowDays? Well, this annual event encompasses Banff’s best winter festivals: Ice Magic, Ice Climbing, and Big Bear each take centre stage to create magic and wonder for those that visit. 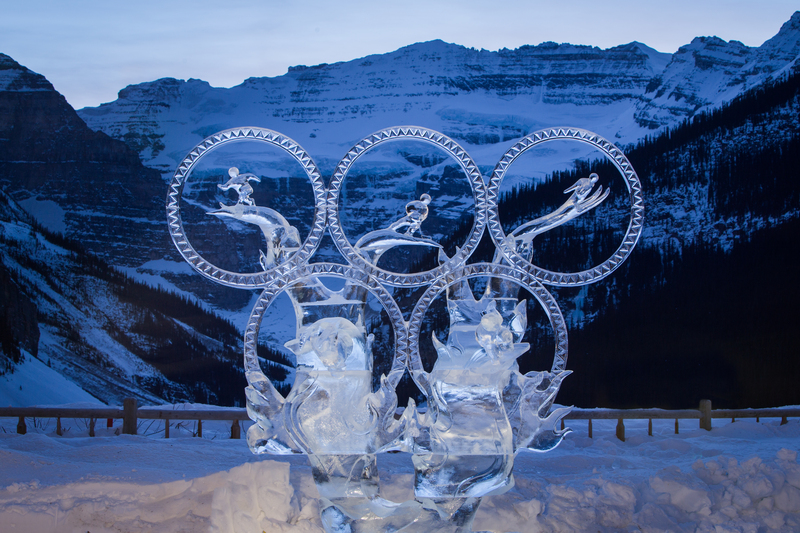 Ice Magic (January 16-25) has been held for 20 years at Lake Louise, where the ‘34 hour International Ice Carving Competition’ takes place- this year’s ‘Wonders of the World’ theme should be sure to showcase unbelievable levels of skill and works to graze upon. For one weekend (January 30-Febuary 1) an ice wall 40 feet high is raised on the street of Banff Ave to celebrate the extreme sport of ice climbing. All levels are welcome and if you’re feeling brave, you can even enter into one of the ice climbing competition. The Big Bear (February 6-8) closes out the festival. It’s a street party outfitted with food vendors, beer garden, and a Terrain Park. Watch local and international ski and snowboard pros pull off huge thrills right in downtown Banff on Bear Street. With daily events held at Sunshine and Lake Louise ski resorts and each night ending with raging after parties makes this a lively weekend. But there’s much more happening throughout the month – check it out. Back in November we stumbled upon Bon Apetit. It’s a food festival that runs for a few weeks and participating restaurants offer set 3-course menus, highlighting regular menu items or offering special fare. There are different price points available, to accommodate your budget or cuisine preferences. There’s also a limited number of tickets available for the Dine Around experience (a guided trip to 4 restaurants with a course at each and drink pairings). The town in winter has a perpetual Christmas feel, with snow glistening in the sunshine on every rooftop. But early December kicks the real Santa season off with Festive Fun and the Santa Claus Parade of Lights. Even in the peak of the summer tourist season, I’ve never seen so many kids and kids-at-heart crowded along the edge Banff Avenue, all waiting for a glimpse of the elf boss. A visit to the Spirit of Christmas store seems the only fitting follow-up to the parade (though it’s one of our favourite Banff stops, any time of the year). Adventure Tip! Look for special deals during SnowDays. Hotels and tour companies this time of year are slower than normal. Most Banff and area businesses offer discounts to draw tourists in, which is an added bonus considering all the great events taking place. 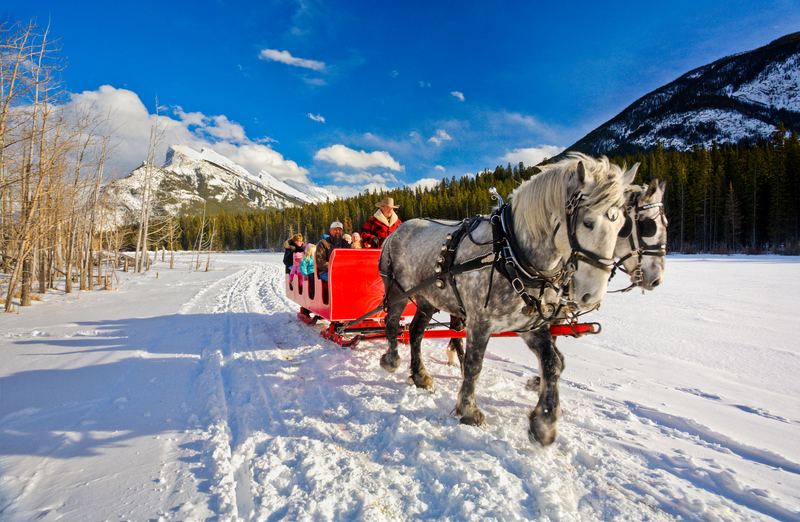 Still on my list to try out is a horse-drawn sleigh ride and in a few weeks we’ll check out the events offered at the Canmore Winter Carnival (February 13-March 1). With so much to do, we may run out of winter – it’s the first time since I stopped skiing that I’ve worried about that! 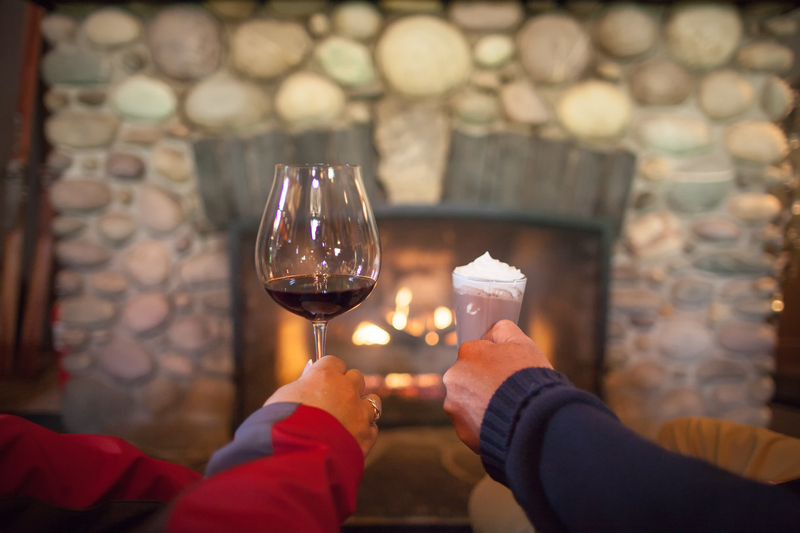 Tell us about your favourite winter activities or what you have planned for your trip to the snowy peaks. No matter what activity you plan on undertaking, just remember to take a second to appreciate the peace and natural beauty of the Canadian Rockies!